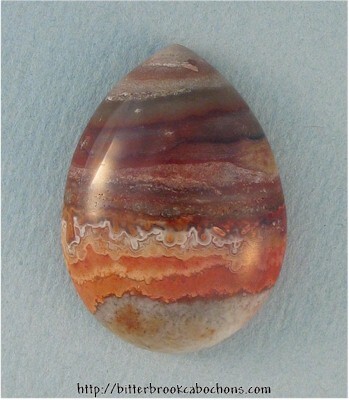 Here's a just-a-hint-of-Lace Agate teardrop cabochon! A different look in this pretty cab! Gloria at Wire Treasures wire wrapped this cab into a pendant; you can see it here! 28mm x 21mm x 8mm. Weight: 32.00 carats. You are visitor number 30 to this page this year.